There is that thing about visiting churches. 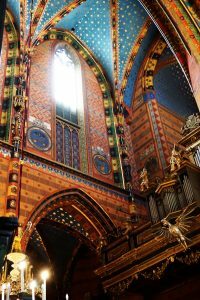 We saw many over the years and if you’re not an expert in the history of art one could say many churches look similar. 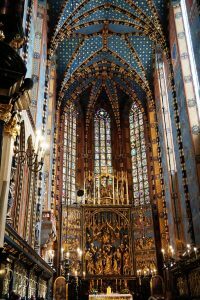 But the St. Mary’s Basilica in Krakow fascinated us. After quite a while, this church was something special we hadn’t seen before. St. Mary’s Basilica is one of Krakow’s landmarks. It can be found in the Old Town on the edge of the main market square. Particularly noteworthy are the two towers. The Northern tower is 81 meters high and has a pointed roof and a clock. The Southern tower is only 69 meters high and home of the medieval glockenspiel. As about so many other things in Krakow, there is a legend about this church, too. It is about the two brothers who are said to have built the towers. Each one of them wanted to build a tower that was higher than the other one. The older brother had finished his tower, but the younger brother still in the process of constructing his. Out of the fear that the younger brother would use this situation to make his tower higher than the other one, the older brother stabbed his younger sibling. The knife can be seen in the Cloth Hall. At 54 meters high in the Northern tower there is the Camber of the Tower’s Watchmen. 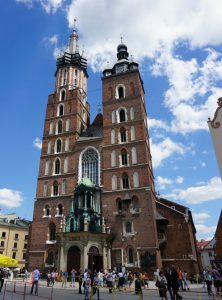 Since the 14th century, it had been the Watchmen’s task to ring the bell at every hour and to blast the Krakow trumpet signal out in all four cardinal directions. Even today, a trumpeter gives the signal from the tower. However, he stops abruptly in the middle of the signal. The reason for this can also be found in a legend. It says that in 1241 a trumpeter was killed by an arrow as he sounded the signal. The tower is open to the public. Every hour a fixed number of visitors is allowed to visit the tower. When we came to see the tower, the time slots were pretty much fully booked. 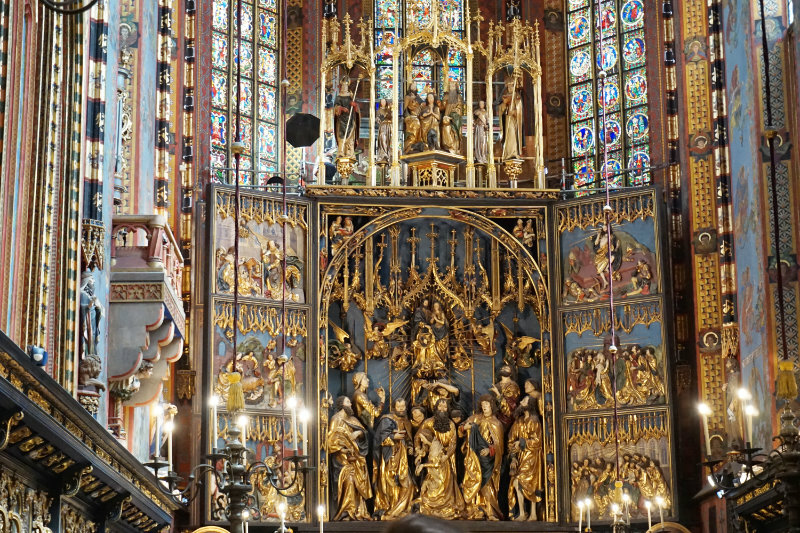 Krakow is especially proud of the high altar by Veit Stoß. 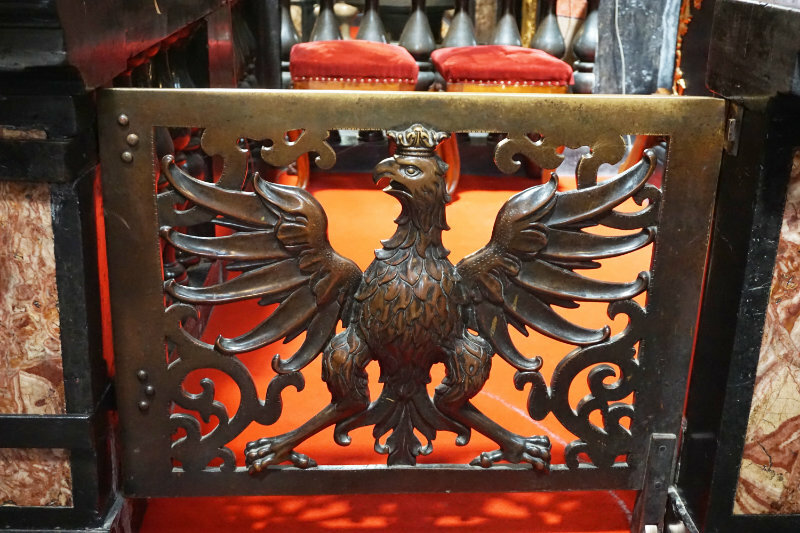 It can be admired in the St. Mary’s Basilica Krakow. We decided to venture inside the church to get a look at the altar. Whoever wants to come to the church to pray can obviously do that free of charge. There is a special entrance reserved for those who come to worship, but from there you don’t get a good look at the altar. Those who come to see this piece of artwork are better off buying a ticket at an office near the side entrance. Please note that an additional permit is needed for taking pictures inside the church. Security staff in the church has an eye on everyone with a camera and who gets caught without a license is charged for the picture then and there. 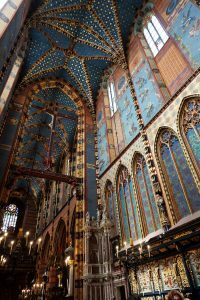 I was enthused by the nave of the St. Mary’s Basilica in Krakow. The mostly blue and golden colours of the walls and the ceiling combined with the red brick make for a distinctive look. Even without a glimpse at the altar, I already found this church to be remarkable. Pompous and so full of details that you should really bring enough time to discover it all. The high altar by Veit Stoß was assembled between 1477 and 1489. It is the biggest altar of its kind in Europe and is 11 meters in length and 13 meters across. The figures on the altar stand 2.5 meters tall. The altar is crafted from lime wood. With closed doors it shows 12 scenes of the martyrdom of Mary. With the doors open it shows her rejoicing, the Promulgation and the Ascension. There was no tranquillity to be experienced in front of the altar when we came to see it. The benches around it were filled with groups who all listened to their respective guides talking about the altar and the church. The room was filled with voices in all sorts of languages. We found ourselves a spot that was a little quieter and sat down to admire the altar. Fantastic! 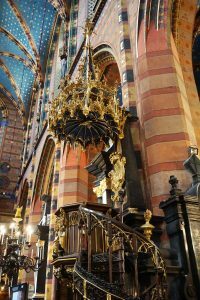 In my opinion, St. Mary’s Basilica Krakow is not to be missed on a visit to Krakow.